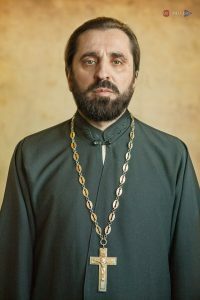 Archpriest Vasyl Ivanovich Kuzmych, birthplace, the Chernovitsky district, Ukraine. Spiritual formation received at the Kiev Spiritual Seminary. November 29th of the year 1992, with the blessing of the Most Reverend Onufry, bishop of Chernovtsy and Bukovina, was ordained to the diaconate by the Most Reverend Antony, Bishop of Ural and Guryevsk, in the Holy Spirit Cathedral of the city of Chernovtsy. December 4th, 1992, with the blessing of the Most Reverend Onufry, bishop of Chernovtsy and Bukovina, was ordained to the priesthood by the Most Reverend Panteleimon, bishop of Kitsman, Vicar of the Chernovitsky and Bukovinsky diocese, in the Holy Spirit Cathedral of the city of Chernovtsy. In the years 1993-2005, was the rector of St. Michael’s parish in the town of Stavchany, Khotinsky region, in the Chernovitsky and Bukovinsky diocese. In the years 2005-2009, performed obedience in the Church of St. Innocent of Irkutsk Russian Orthodox Church (Moscow Patriarchate), in the city of Redford, MI (U.S.A.). On September 4th of the year 2009, was appointed rector of Holy Trinity Church of the Russian Church Abroad in the city of Milwaukee, state of Wisconsin, Chicago and mid-American diocese, by The Most Reverend Peter, Bishop of Cleveland and administrator of the Diocese of Chicago and mid-America. On March 14th of the year 2013, was appointed temporarily to perform the duties of rector of the Russian mission in honor of the icon of the Mother of God “Tender Mercies” in the city of Madison, state of Wisconsin, Chicago and mid-American diocese, by The Most Reverend Peter, Bishop of Cleveland and administrator of the Diocese of Chicago and mid-America. On the 1st of July 2016 Peter, Bishop of Cleveland Administrator of the Diocese of Chicago and Mid-America, has appointed Father Vasil Acting Rector of the Russin Mission of All Saints, located in Fargo, North Dakota, of the Chicago and Mid-America Diocese.